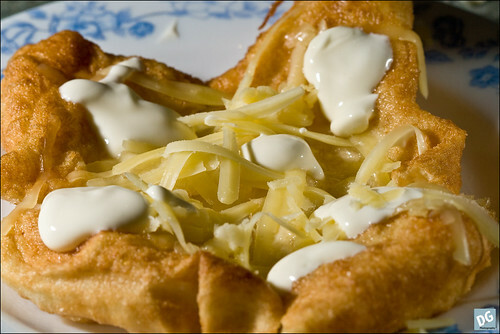 At the recent Abbey Medieval Tournament I had an Hungarian Langos for lunch. This dish is quite tasty, and very easy to make, so I made some for afternoon tea today. This recipe will make four small langos, or 2 larger ones. Combine the flour and yeast with your fingers, rubbing in well. Add the salt and lightly stir through. Add sufficient water to make a thick sticky dough – basically just enough to absorb the flour, not too much or you’ll need more flour. Mix together well and turn out onto a board or workbench to knead. Knead in the French style, making sure to capture much air in the dough. (Pick up the sticky dough in the middle, whack one end onto the bench and fold over the other end, repeat). The dough will eventually become smooth and springy. Set aside to rest for 1/2 hour. Once rested, carefully tip out the dough onto a floured surface and then carefully stretch out into a square. Cut into four (or two for larger langos). Stretch out each piece with your fingers into a rough square with the centre being thinner than the edges. Place into hot oil, turn once such that each side is golden. Optionally brush with garlic oil.